While I haven't gotten to the part of today's WWDC keynote introducing iCloud yet, after seeing that there is a new Find My iPhone/iPad/iPod touch app out today, I went looking for what services are being offered. Looks like we can forget MobileMe becoming a free service. She's done for in her current form and iCloud will completely replace it. I'm going to have to watch the stream on this one and decide if I'm interested in using the new iCloud service. I would have gone in on MobileMe if it was free or cheaper than $99/year, but I'm not really one for streaming content if I have the option to download it to a Mac or PC on my home network. 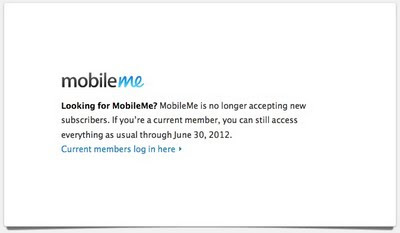 Existing MobileMe customers can still access their accounts from the MobileMe.com website.